Info on 2014 Epi (New) Century amp when?? I can't find any specs !! and i'm very interested in this amp as it's a real looker. I see tubes in the "news release" photo, and 3 inputs (Bright/Normal/Dark) and i've perused Epis website and done a few online searches but can't seem to find any real specs on this amp. c'mon...stop teasing me and tell me something meaningful about this tantalizing new amp !! You won't hurt its feelings boy, play it like you stole it! I'm a proud supporter of the A.S.P.C.A. and their "Guardian Angel" program. A.S.P.C.A . We Are Their Voice ! I want to know US street date and pricing! Would love to get my hands on one! thanks Midtowner, I think I will wait to see if any domestic dealers get this in stock, something tells me it may go a little cheaper for me that way!!!! Holy profit margins Batman, am I missing something here? Guitarguitar £469 (expected delivery date is Tuesday, June 17, 2014), Thomann £278 incl. free shipping to UK, due to arrive on 07.03.2014.
thanks for the info...and I mean THANKS !!! now, how to get one in the US, because i've GOT to have 1 before they sell out/increase in price. time for online shopping !! not available in US yet......have a letter of inquiry sent to my S.E. at Sweetwater asking when/if they'll be able to special order me one. When is this being released?! Why does this keep getting pushed back? I pre-ordered a long time ago and it's driving me nuts! 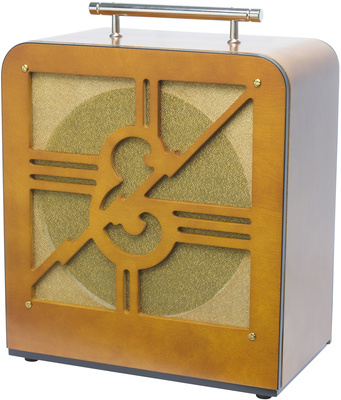 I want this amp now! The expected date from Zzounds is August 10. I haven't pre-ordered one, but I like the look and it is tempting. Ok I didn't see this thread before I started mine. Please feel free to delete mine Admin. Thanks. Sorry. On Amazon it says "Usually ships within 3 to 8 months." It's not a made-to-order amp, is it? So expected date now Sept. 8...Is this going to keep getting pushed back to next year? I'm going to cancel my order soon. hopefully they'll be hitting retailers mid Sept. when I get my annual employee profit share! I don't understand the ways that some products are rolled out. I wish they would wait until very close to the time of actual availability instead of releasing information, starting some preorders, building excitement and anticipation, then continually pushing back availability dates to the point that people start to get upset, then angry, then by the time the product is finally released - the excitement has waned, people cancelled preorders and moved on to something else. They seem to do themselves more harm than good when they announce new products then wait several months to a year to actually make them available to purchase. Crazy. ever seen a pack of hungry wolves eat after having raw meat waved in front of them for a few hours? Kind of reminds me of when the Gibson Kalamazoo came out.